Fit Fluential Mom: Zucchini "Noodles" with Shrimp! Clean, low carb, easy to make & SO FREAKIN good! I make a LOT because I make for dinner then like to have leftovers for the next few day's lunch (aka meal prepping) so use the quantity you'll need for you and/or your family. If you don't have a spiralizer or vegetti to make the noodles, get one. Worth every penny! Amazon, eBay, Walmart, Bed Bath & Bayond, they all carry them! Just sauté onion, pepper, carrot, zucchini and season with your fave no salt seasoning. If you use salt, choose sea salt and black pepper to taste. Then sauté the shrimp with garlic, black peper and some red pepper flakes (if you want to add some kick to it & kids won't be having it. My kids eat whatever we eat so dad adds the pepper flakes to his AFTER it's served). 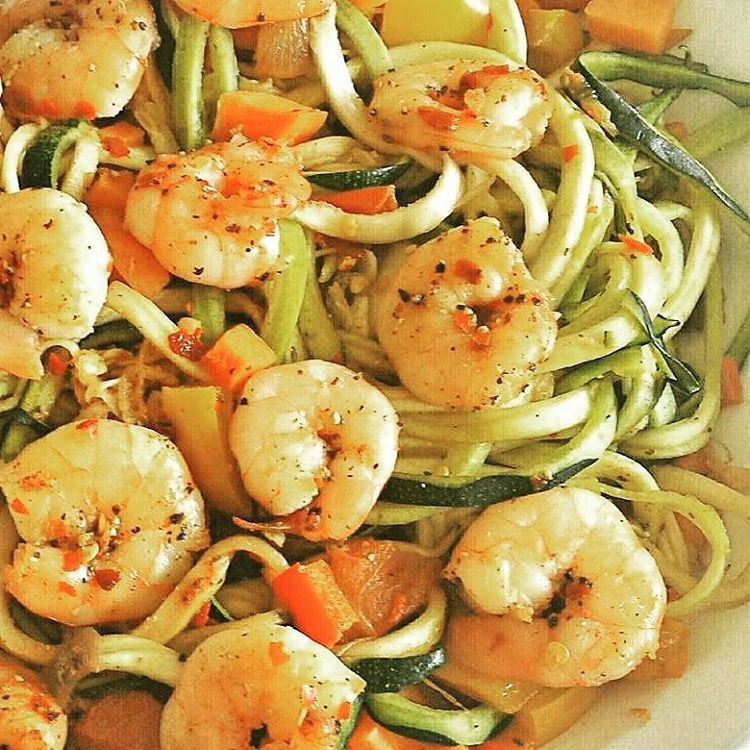 Serve veggies then top them up with the shrimpies! So delicious and very filling for a low carb meal.